Pioneers in the industry, we offer da21 4 channel data recorder for sound and vibration from India. 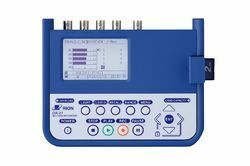 The Rion DA-21 4 Channel Data Recorder is suitable for extended data recording of Sound and Vibration measurements. The user has the ability to choose from utilizing any combination of microphones and accelerometers to allow for comprehensive measurements. The data is saved in WAVE form and reproduced as analog signals. Data can be exported into a computer for waveform analysis and other processing tasks.